Some interesting performances… | What, Where, and Wen! 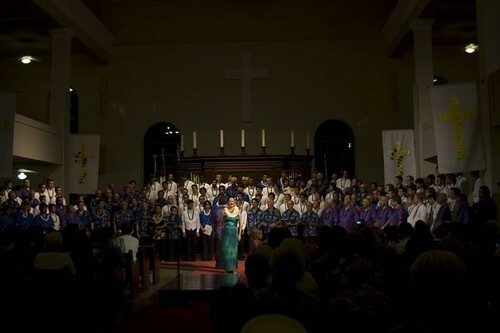 Wednesday night’s big event was the famous Kawaiaha’o Church. 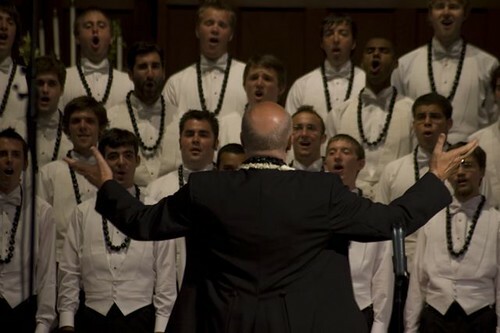 Likened as the Westminster Abbey of the Pacific, it has a simple, colonial grandeur to it that made a very warm sound for performances. This night was the first annual Na Kane concert ever. Translation? “The Men”. 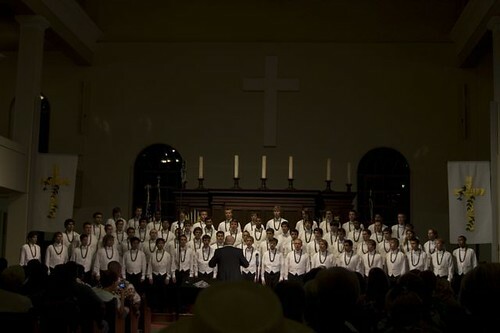 It brought together the Honolulu Youth Opera Chorus, the Somoan Gospel Heralds, Aaron Mahi’s Alumni Glee Club of the Kamehameha School (who we’d rehearsed with the night before), and a barbershop choir, The Sounds of Aloha. The night ended with a full combined choir performance of Honolulu by Neil McKay featuring the very famous Hawaiian dancer, Kanoe Miller! Our preparation for it got a little interesting however. With no group rehearsals ahead of time, the dress for the concert was a bit confusing. 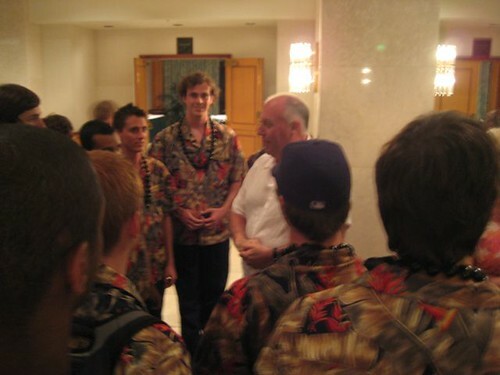 Turns out every group had their hawaiian shirts and slacks on, and we had arrived in our coat tails! 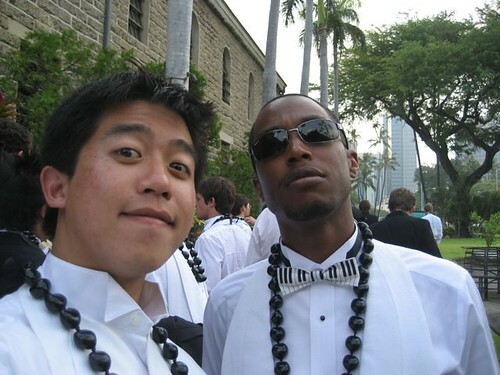 Alas, it was too hot in the building for jackets; our tuxes with the white shirts and kakui nut necklaces looked pretty darn good. 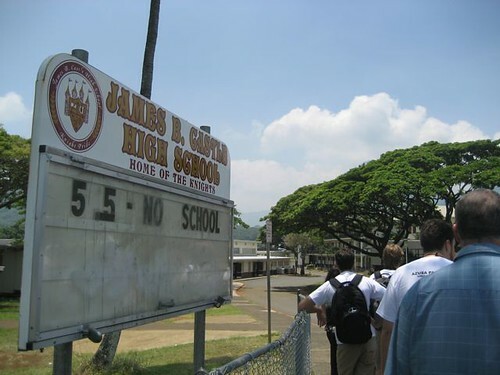 The next day, we took a smaller group to visit Castle High, the school where Bryan Clay attended before coming APU. It was a bit of work singing all morning for the students, but we had fun. 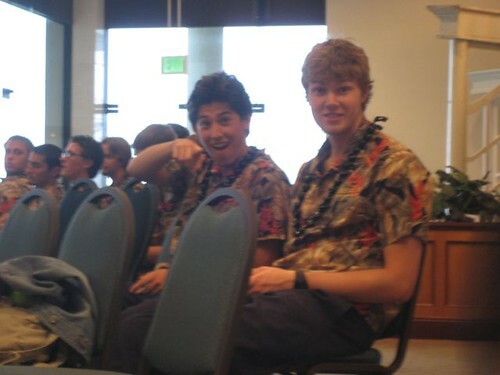 The first was a polynesian music classes that included a ukulele army with a few guitars and vocalists. As they played a few songs for us, we all couldn’t help but notice how relaxed their sound was! 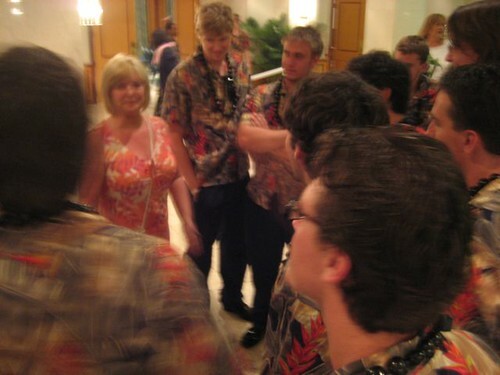 It just made me happy… the singing in Hawaiian, the ukuleles,… yes, I can see it now. Palm trees and white sand. Perfect. We finished the high school visit by checking out their wind ensemble rehearsal and the track team, gave some promo material, and headed onto our next performance with the rest of the chorale. The First Presbyterian Church on Oahu was on a golf course, one of the hardest in the world, I hear… the Ko’olau Golf Course. It was a beautiful location, Jurassic Park seemed to be right outside the window. Unfortunately, the VOG wasn’t helping. The middle of this week brought a smog mixture of volcanic ash from the big island; a volcano had gone off and the wind blew the stuff over to this island. I don’t think most of us felt it as much as all the newspaper headlines were yelling out. We’re from LA after all. 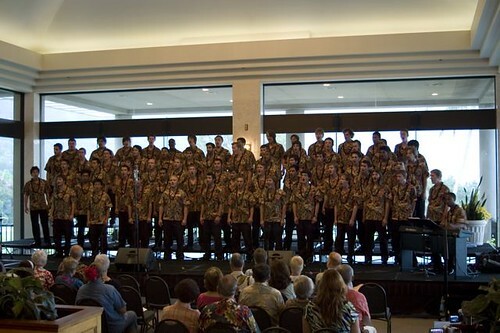 Well, we were to perform that evening, along with two other musical groups. Our numbers were at the beginning, and the very end. What happened next was pretty amazing for most of us. Having finished the performance, the audience, other bands, and all of us shared some fellowship time with baked goods and coffee. A lady came up to me quite flustered asking for a schedule of our next performance, so I told her and she went on her way. As the last people left for the night, we were getting ready to board the bus. A few whistles from Harold brought us all back into the lobby of the building. There was the lady I had spoken to along with her husband. They had driven for hours to get here tonight, but had lost there way and made it just in time to catch the last few chords of the performance! We couldn’t let that go now… an impromptu concert came about and we circled the couple in a round and sang for them. Wow, first, what joy we had brought them, a special performance for them. Secondly, what joy we sang with. 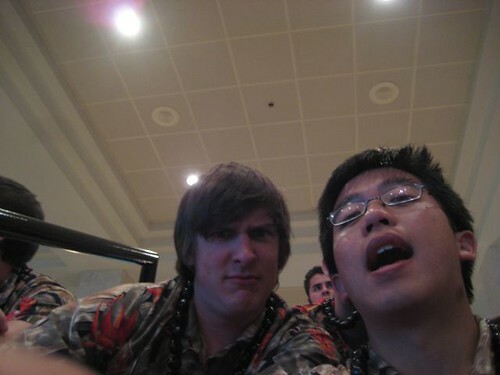 To repeat what other guys said later that night, we seldom sing so freely and without any hindrance! Turns out the gentleman is head of something at the Salvation Army and they were from England. Who knows how the chorale will be used in the future, especially having him express how he’d like to keep in contact and use us! On another note, I wonder how many people know about this. So, all the rage for the last few days has been Cha Cha. Do you know Cha Cha? Got a question? You should ask Cha Cha.